Radio New Zealand has the most detailed online report I can find about the coroner’s recommendations that follow the January 2009 accident where two Australian tourists died under the collapsing terminal face of Fox Glacier. The Coroner has recommended “restricted access” to the Fox, and possibly the Franz Joseph Glacier terminal faces, suggesting a new law and measures such as instant fines for people who get too close without a guide or some kind of official authorisation. So far the Department of Conservation has said it’ll consider the recommendations, but needs to discuss them with the Minister of Conservation. It’s already made changes to the signage, and worked with tourism operators to increase awareness with members of the public of the danger around glaciers. 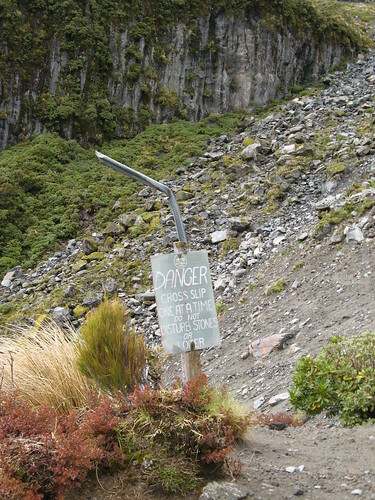 What this recommendation seems to be suggesting is that legal restrictions against approaching the terminal face of Fox Glacier, and possibly Franz Joseph Glacier, should be put in place because those parts of the New Zealand Conservation Estate have been made so accessible, and because many people (informed or not) hop the recommended safety barrier. It’s a terrible thing for all concerned when accidents like this occur, but I agree with Richard Davies, the President of Federated Mountain Clubs, who is strongly speaking out against what the coroner has asked for. Some of his comments are relayed through the first link at the top of this post. Richard is right when he points out that imposing legal restrictions for access would set a dangerous precedent. If such restrictions can be put around the terminal face of Fox Glacier, what’s to stop them from going elsewhere, and where does it stop? Would we see restrictions in something like walking up to the Crater Lake of Ruapehu, also popular with tourists, just in case the volcano burps again as it did in 2007? Why is it fair to issue fines to people who choose to take these kinds of risks, and how is that reliably enforced without missing scores of people acting silly for the wrong reasons, yet catching people who break the rules whilst being suitably careful? The conservation estate is an awesome place, but it’s also a place where it’s important to be responsible because, when it comes down to it, it’s wild and has potential to be dangerous. The legal ability of the Department of Conservation to restrict access to public land is very restricted, for good reasons. Even though it’s typical to see signs that say things like “Track Closed”, such signs are not usually enforceable, despite the attempts of some local conservancy rangers to insist that they are. This is because DoC’s main purpose in this domain is to be a caretaker on behalf of the New Zealand public rather than a property owner. The law that defines how a conservation area may be closed is primarily described * in section 13 of the Conservation Act 1987. While the Department of Conservation doesn’t have direct power to close an area, sub-section (1)(c) states that the Minister of Conservation may designate an area “closed” for “reasons of public safety”. Note that doing this should not actually require a law change as was requested by the coroner. It’d be a sad day if anything like this happened in anything but the most extreme circumstances, however. It would also set a disturbing and slippery precedent, because there’s such a history in New Zealand of people being able to independently explore, learn about and understand the risks, and take responsibility for their own actions when entering hazardous places on the country’s public land. If there happens to be an accessible road for reaching that place, it should make no difference to the legal rights of people who want to go there for reasons other than tourism and taking photographs. I won’t clearly comment on the details of this specific case or the specific people involved because I don’t know the exact details or the people or specifically what happened. Supposedly this safety barrier was frequently ignored, as are some others. DoC has said that in 2007, “almost a third of the 600,000 visitors to West Coast glaciers ignored warning signs and entered danger zones”, so the two unfortunate people weren’t doing anything uncharactaristic for tourists to Fox Glacier when they hopped the barrier and stood underneath the the terminal face for a photograph. To me it seems that if someone crosses a safety barrier, they must have either been unaware of the danger (in which case the information and education needs improvement), perhaps there is no reasonable danger (in which case the placement of barriers should be revised lest they reduce respect for barriers elsewhere), or they’ve made a conscious and informed decision to take a risk, in which case I think people should be responsible for their own precautions, safety and wellbeing, just as happens everywhere else in the conservation estate which is equally open to everyone, and in many cases equally if not more dangerous. Again without being specific to this case, I think there’s often a misunderstanding with expectations of some visitors (and some locals), who anticipate that New Zealand will be comparable with some other countries where it’s difficult or illegal for tourists to go anywhere or do anything that might be considerably dangerous. Generally New Zealand doesn’t have these kinds of restrictions, and also happens to be a country that can be and is often visited by people independently from sheltered tour groups. If it appears that places are safe when they aren’t, that appearence needs to be addressed rather than putting up legal walls that will inhibit the rights of people able to make informed decisions. I like the way the conservation estate here is so accessible, and the last thing I want to have to do is to obtain a licence or arrange to attend a training course to enjoy myself in a way for which I’m completely responsible for my own safety and nobody else’s. Rather than impose legal restrictions, there needs to be a clear focus on proper education and communication with tourists, and probably a few locals, that these actually are genuine wild places. No doubt some people will still take informed risks, and occasionally pay for it, but that’s part of it—what’s important is that people know they’re taking risks, and what the risks are. Here’s a sign in Egmont National Park. * Section 38 of the Walking Access Act 2008 outlines further ways in which officially designated walking tracks can be “closed”, but for this to be legally possible, the track needs to be designated as such a track by publication in The Gazette (the official newspaper of the Government of New Zealand). As far as I can tell from a lot of searching, there are no such tracks that have been so designated, at least since 1993 which is the earliest data available for the online archive. This entry was posted in musing and tagged department of conservation, federated mountain clubs, glaciers, government policies, mountaineering, musing, tourism. Bookmark the permalink. I see another person has died, this time on Franz Joseph. It seems a Korean tourist strayed off track and took a fatal fall over a cliff. Something probably needs to be done but I agree that restricting access is not an approach I would want to see, I too enjoy the freedom of access we have to our wild places and would not like to see those freedoms compromised. Perhaps, as you have suggested, some serious thought needs to be given to how we make sure the people visiting these places are better informed about the risks they need to be aware of, therefore enabling them to make better descisions about the risks they do take. In the end though I also think it needs to be understood (by those that are responsable for the changes to policy/legislation that often arises from this sort of thing) that taking risks is part of human nature and that these kinds of accidents will never go away entirely, no matter what measures are put in place. FMC’s now pressing their stance on their facebook page, and I posted a ranty response (in support) which, I guess, more or less that the coroners’ process feels as if it’s flawed, and that’s the impression I came away with after the Kime Hut thing as you may have gathered. Perhaps it isn’t, but I don’t understand how the coroners have reached these conclusions, unless they’ve focused entirely on specific accidents and specific direct causes without considering wider contexts. I think your last two lines sum it up Mike. I remember with this one all the HATE that was sent to the guy who owned the rental car company whose keys were buried under the ice with one of the boys because he wanted to charge the family for retrieval of the car. It was their choice to come to NZ on holiday without insurance… I really felt for him to be honest, it wasnt his fault and his insurance company wasnt going to cover it, so why should he be out of pocket? Anyway, back to the safety thing: Both glaciers have LOTS of signage. Well, at least they did when I was there 10 years ago and I doubt it will have gone downhill since then. Every time the track came close to the barrier there was a sign warning the face was dangerous. What else can they do apart from close the road way back at the township…? Hi Amelia. Thanks for the feedback. I haven’t been to either glacier for a long time and I don’t know how much it applies in this instance, but I’ve wondered if sometimes there can be too many signs that people have less respect for them. If a sign says “don’t go past this point” and there’s no obvious reason of why not to, people will tend to ignore it. (Sort of like things like laws against jaywalking when it’s obvious that a road’s completely empty of traffic and there’s no alternative quick way to reach the other side.) At a place like the terminal face of a glacier which will change over time, it might just be that the signs need to be more closely monitored and obviously adjusted in a way people can see that they’re being kept up to date, and so they accurately reflect where the actual danger is. The other controvery at the time was around a hotel manager who refused to drop a $100 fee when they didn’t show up. I kind-of think of travel insuance as something that should cover costs when your flights or bags get messed up, or pay your $80,000 medical bills when you get sent to a US hospital, and those kinds of things. It’d be nice if an overdue rental car in this sort of situation were covered by a service provider’s insurance simply because of the number of people who go without travel insurance, and just between NZ and Australia it’s usually less critical given the amount of cross-border cooperation with stuff like covering medical bills. I guess it’s a tricky situation.